Today we have a special guest on Yoga with Melissa – Aprille Walker from The Yoga Ranger Studio. 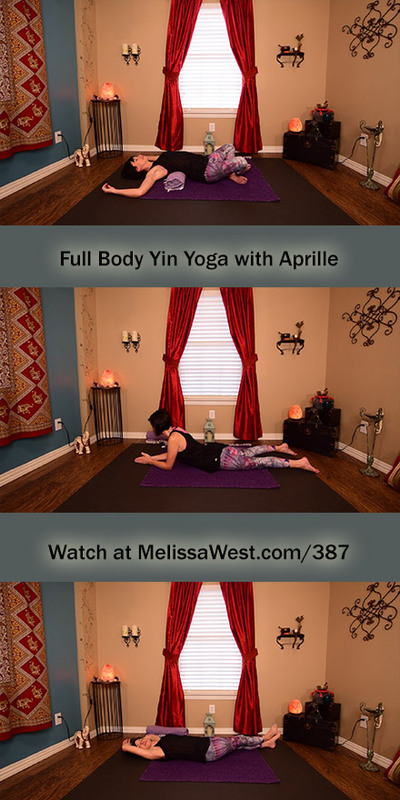 Aprille offers a variety of practices online including Yin Yoga, Restorative, Flow, Pranayama (breath regulation) and Meditation. Aprille invites a turning inwards and quiet reflection in her yoga classes. Her yin yoga offers long holds so that you can be with your own inner experience and that is what I appreciate most about her teaching style. This practice is all about connecting with your body, mind, and breath through longer held, ground bound poses. We will be beginning at the top of the body and working our way down for a “head to toes” Yin Yoga experience – releasing tension, connecting to our breath, mobilizing our connective tissue, strengthening our bones/joints, and sensing our entire body as a whole. What is an appropriate depth? Each person has a range of motion (changes day to day, hour to hour sometimes). In Yin, the idea is to find your edge, that point where you at your deepest and take a few steps back to maybe 2/3 of your full depth in the pose. During the hold, you can check in with your body and see if this is enough – sustainable for the whole period of the hold – or if you need to checkin at the “gate”. The Gate Theory of Yin Yoga holds that as you check in with your body during the pose, you may find that it is releasing and you can open the gate and go deeper OR you may find you are perfectly well where you are at OR you may find you need to pull back a little more. Each person much gauge this for themselves. Any pain – sharp, shooting, causes breathlessness – is BAD and you should back out of the pose or come out altogether. However, feeling pulling, deep stretching, tightening is completely normal. Resolve to remain still. In a world where we are overwhelmed and overbooked, this concept can be quite hard to put into practice. In Yin Yoga, we are in the pose for and extended period and most people find themselves fidgeting quite a bit. I always suggest you get your “settling in” movements out in the first minute and then focus on your breath and checking in with your body to keep you still and in the moment. Hold the pose. Here’s where the first 2 principles really come in. Beginners often hold the poses 1-3 minutes. More experienced practitioners of Yin will hold poses 4-8 minutes. If you are at your appropriate depth and are settled in to stillness, time will not be a huge issue for your body but your mind might feel otherwise. This is where my 4th principle comes in – be patient with your mind and body, breathe deeply, notice how you feel and resolve to use this time to turn inwards and find peace and quiet. Some poses are more difficult some days and you will need to really focus! One last note on HOW to practice Yin Yoga – focus on releasing the tension of the muscles, the body as a whole – while breathing into those areas with the most tension. This will facilitate your overall experience and you will experience more softness in the poses.